Started this blog with every intention of primarily focusing on offense – my favorite aspect of the game. But for those who know my tendencies as a coach, they know while I like offense, people also know that when it comes to defense….I’m in the zone. I guess what else would you expect from a Syracuse University grad?!? When I first started coaching I wanted to be a man 2 man coach. Aggressive, denying the pass, in your face, mug you kind of defense. But quickly, I soon saw the value of playing zone. Here are 4 reasons why I love playing zone. 1. The size and quickness of the players can effectively take away the open 3-point shot. 2. 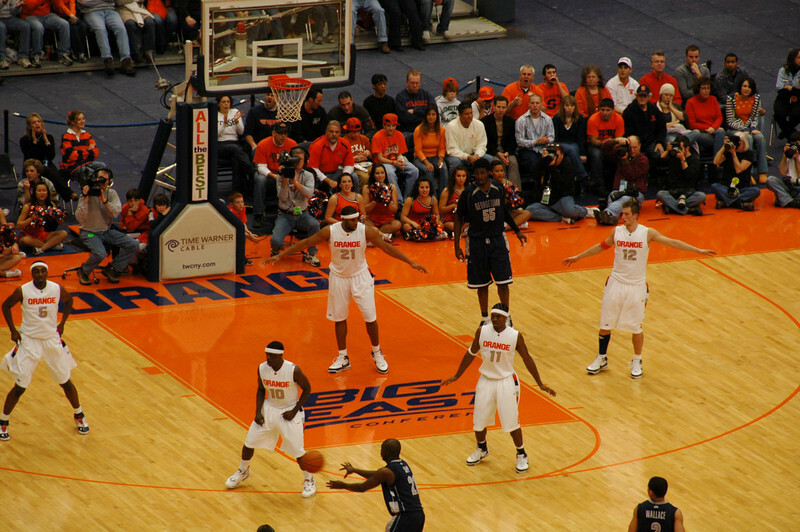 Teams spend most of the season working on their man-to-man offense. 3. It is easy for a team that plays zone to know what its opponent will do against them. There are far more man-to-man offenses to prepare for than zone offenses. 4. The zone can dictate the tempo, not to mention momentum, of the game. Numbers 2 and 3 are key elements. I’ve noticed that very few teams will run plays against our zone. They just pass it around hoping to get a good shot. And in many cases, when teams don’t have plays to run against our zone, what inevitably happens they get frustrated and their frustration becomes visible. You see teams start bickering and arguing amongst themselves. They get exasperated with one another. I absolutely love that element of the game….playing the type of defense that gets inside the head of an opponent. I love this psychology part of the game. Getting into the minds of opponents. 1. 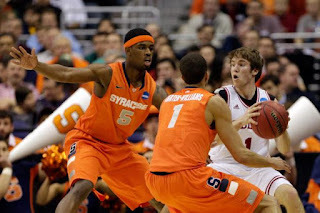 Contrary to popular belief, Syracuse’s 2-3 zone is not a “passive defense” by any means. 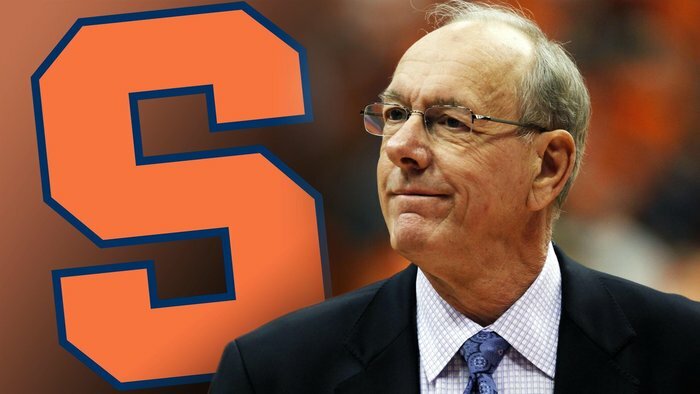 It’s not a defense that Jim Boeheim uses to mask his team’s weaknesses, rather it’s a defense he uses to utilize his team’s length and athleticism. For my team the zone best utilizes our quickness and athleticism, in particular our guards. We have quick, pit bull guards who can be very disruptive. Coach Kent Tacklyn is big on pressure and has our guards pressure the ball, he wants to disrupt the ballhandler as they cross halfcourt. As a result, we play an extended zone. Not passive in any shape or form. 2. There are a multitude of traps that Syracuse can run out of the zone but it is not generally known for forcing a lot of turnovers. Instead the zone holds the opposition to a low shooting percentage by forcing them into uncomfortable shots altered by the length and athleticism of its defenders. 5. The way Boeheim coaches the 2-3 makes it even more impenetrable. “He concedes the baseline. 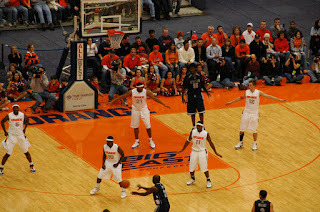 The back three in the zone allow foes five feet out from the baseline. If you try to exploit that gap by passing to it, they trap you with two monsters. If they’re late getting there, they’ll block the shot. (Mick Cronin). 6. With the baseline ignored and the zone extended, good shots become hard to find. That’s when the psychology of the zone kicks in. It takes so much effort, constantly cutting inside and back out, just to get a shot. If you miss it, that’s where it really affects you psychologically.’’ (Mick Cronin). 7. What people don't talk about is the quickness, the speed that allows Syracuse to recover and to close a gap that for a split second looks open. This quickness plays to my team’s strength as well. It’s the players' speed that is deceptively critical. As Jim Boeheim’s right hand man Mike Hopkins says, “It's like when Miami started putting safeties as linebackers and defensive ends," he said. "It just looks like speed so it's like, 'Oh, that's open. Uh-oh, no it's not." It almost looks choreographed. You can see two men slide, and then two men slide over behind them, and, anytime a slice of daylight appears, there’s an arm and a hand there to block it. The traps come suddenly, and from all angles, and with startling speed. You never get two identical looks from the zone on successive possessions. It is a simple defense played within a universe of creative variations. And there you have it, why I love to play zone. For me personally, as I mentioned earlier, it plays into the psychology of the game. When played well, it can get into your opponents head. And that, many will say, is half the battle in playing winning basketball.